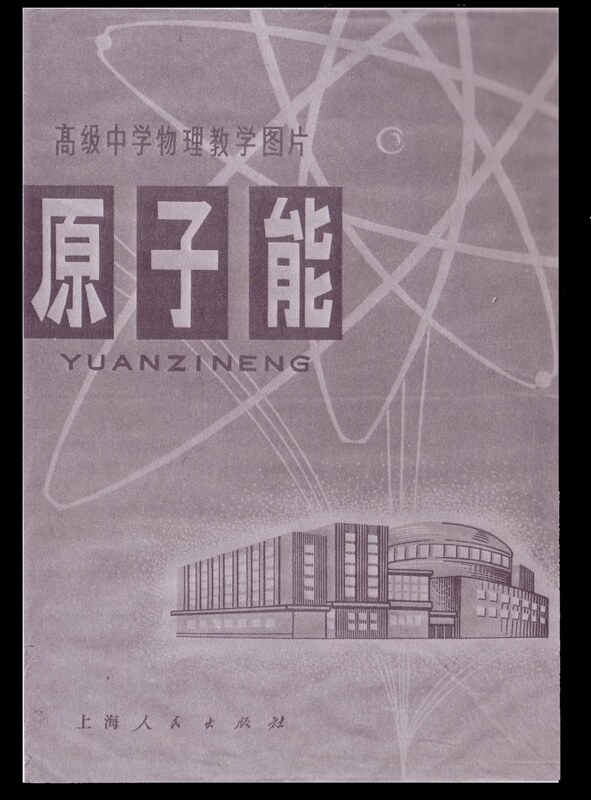 During the late 1950s, China already introduced nuclear technology made in the Soviet Union, its purpose obviously being the production of nuclear weapons. Much later, in the 1970s i.e. 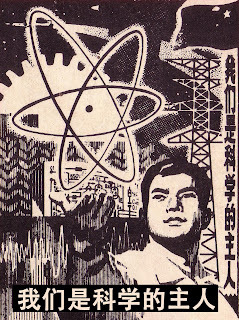 namely in the aftermath of the so-called Cultural Revolution, China began official nuclear plannings to ensure its increasing need of electric energy. It signed treaties with Germany and France and showed itself interested in nuclear technology developed in the United States of America. 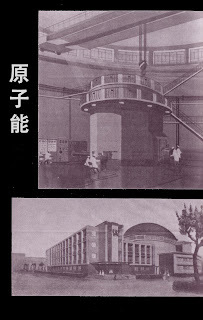 At that time, one of two French nuclear reactors using U.S. technology from Westinghouse was planned to be erected north of Shanghai to provide electricity for the gigantic steel production facility there. 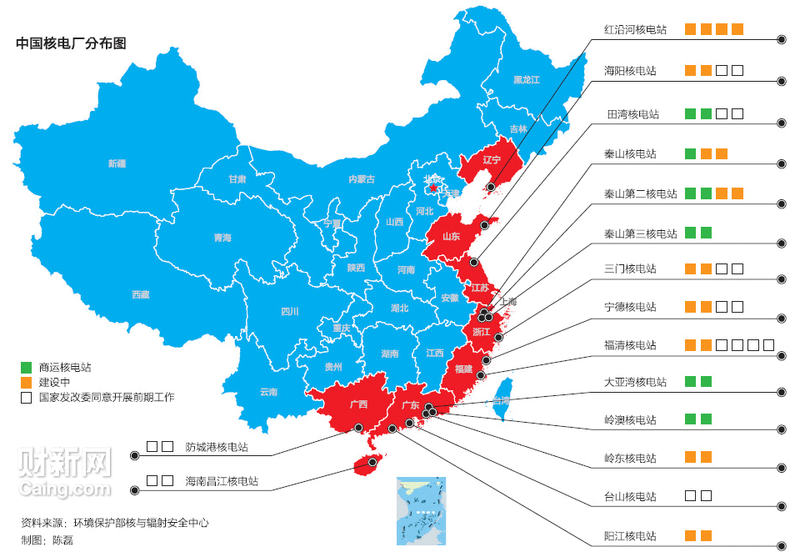 Until now, nuclear energy plants have been installed in different parts of the country. As the Chinese learned their "nuclear lesson" almost from scratch, it was inevitable that one or another "incident" occured in their energy plants or research facilities. The best known example is referring to the research reactor shown below that had been heavily contaminated during the 1970s. 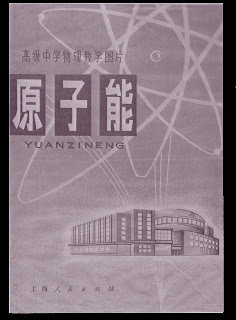 The Chinese found a pragmatic solution to deal with that problem: They closed the facility and did not mention this place any more. By the way, my visitors are requested to enjoy the modern architecture of the building with its many windows to ventilate the whole thing. "We are the masters of science !" The reactors to be switched off immediately because of public pressure on the federal government and the suppliers of nuclear energy. ..... accounted for the ruling party's heavy losses in two regional elections last weekend. Places actually held by the rebels are marked in white color. As can be seen, the rebels' army is now approaching the town of Sirt, Gadafi's birthplace. All places marked in red color are battle zones, either subject to allied bombing or endangered by the rebels. "According to an eyewitness, the barracks of Gadafi's units at Bab al-Aziziya in Tripolis have been evacuated." [Al-Jazeera, Arabic TV]. It was here that Gadafi delivered an aggressive speech to his followers shortly after the uprising began. The role of Turkey in Libya. "Turkey has three responsibilities which are the administration of Benghazi airport, the surveillance of Libyan airspace and the deployment of naval forces in the sea corridor between Kreta and Benghazi." Libyan rebels enter Ras Lanuf after having gained control over al-Aquila, al-Brega and Ajdabia while Gadafi's units are retreating. A correspondent of Al-Jazeera [says] that rebels captured weapons left back by [enemy] units in Ras Lanuf. According to a correspondent of Al-Jazeera, the rebels captured 40 mercenaries at Ras Lanuf. Captured: A relative of Gadafi ? 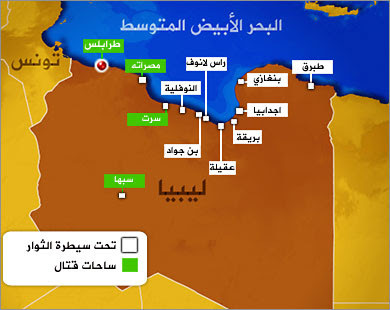 A correspondent of Al-Jazeera [says] that Libyan rebels are gaining back al-Sidra near the town of Ras Lanuf. [A speaker] of the rebels [says] that they have gained control over the port of Misrata al-Libia where 7500 foreigners are being [stranded]. The Egyptian prime minister Asam Sharif arrives in [the Sudanese capital of] Karthoum on his first foreign visit as a [high-ranking] Egyptian official since the successful revolution on January 25. The Egyptian stock market: Ending of the temporary circulation of a risky hausse of short-term titles. Due to a dangerous leakage in, at least, one reactor radioactive iodine gained access to seawater. 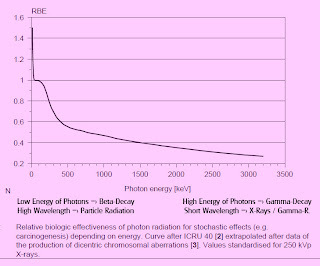 The actual iodine intensity is now 1.250 times higher than normal. The day before it was only 100 times higher. On Wednesday, three rescue workers had already received a dangerous dose of radioactivity while they had to pass a pumping room that is still partly flooded with water leaked from one of the reactors. Decontamination of the world's greatest aircraft carrier USS Ronald Reagan which participated in rescue operations during the first days after the earthquake and tsunami impact when a nuclear catastrophe at the Fukushima energy plant was already in sight. The French news agency [AFP] informed that a Syrian official told them about 10 protesters who died in the town of al-Sanamin in the southern part of the country. Dead and wounded left by bullets from Syrian security forces during the dispersal of demonstrations in many townships and villages and that are demanding a reformation [of the state]. Nationwide reaction invoking the violent [security] operations against protesters in Syria. A spokesman of the White House [said]: "We are intensely taking notice of the violent [police] operations in Syria, and we are urging the government to stick to peaceful measures." The British minister of state in charge of Middle Eastern and North-African affairs [said] : "I [heard] about the intensifying disorder [confronting] the use of violence against protesters. For all Syrian citizens, [there is] the right to express their opinion in a peaceful way." Second day of confrontation between Algerian security forces and citizens who are confronting the demolition of their houses in one municipal district of the Algerian capital. There have been clashes as well between protesters and security forces in the Syrian town of Daraa. Up to now, reliable photos of the Syrian uprising are rare. Damage done by tsunami to the Fukushima nuclear plant no.1. shortly after the tsunami came in (below). NATO Jet going to be Refuelled in the Air. Concentrated shooting and tank granades from Gadafi units on a [hospital] compound at Misrata left [many] dead. A British commander [says]: "We destroyed the Libyan air force." A Brish commander [says]: "We are following Gadafi's troops from close and we attack them whenever they are endangering civilians." "What did the foreign minister of Germany have in mind all the time ? First, he acclaimed Arabic freedom fighters in their revolutions and made himself acclaimed on Tahrir square in Cairo. Then he demanded the overthrow of Gadafi - only to shrink back in the security council afterwards. This has not much in common with a foreign policy based on values." This is what Germany's former minister of foreign affairs Josef Oskar "Joschka" Fischer said after the actual foreign minister Guido Westerwelle (Liberal Party) defended the position of the Merkel government that had come to the decision not to take part directly in the military action against Gadafi. Such leaving all activity within the European Union to France who then shared the international military action on its own. "Was hat sich der deutsche Außenminister dabei gedacht? Erst schlug er sich auf die Seite der arabischen Freiheitsrevolutionen, ließ sich auf dem Tahrir-Platz in Kairo feiern, dann forderte er den Sturz Gaddafis - nur um schließlich im Sicherheitsrat den Schwanz einzuziehen. 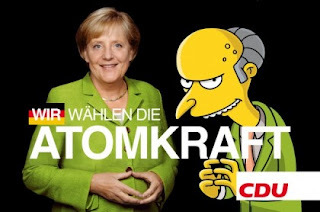 Mit einer an Werte gebundenen Außenpolitik hat das nicht viel zu tun gehabt." Libyan radar facilities destroyed near Benghazi during nightly attacks by the international alliance. CNN reporting. March 22, 2011.
emitted from the power plant. 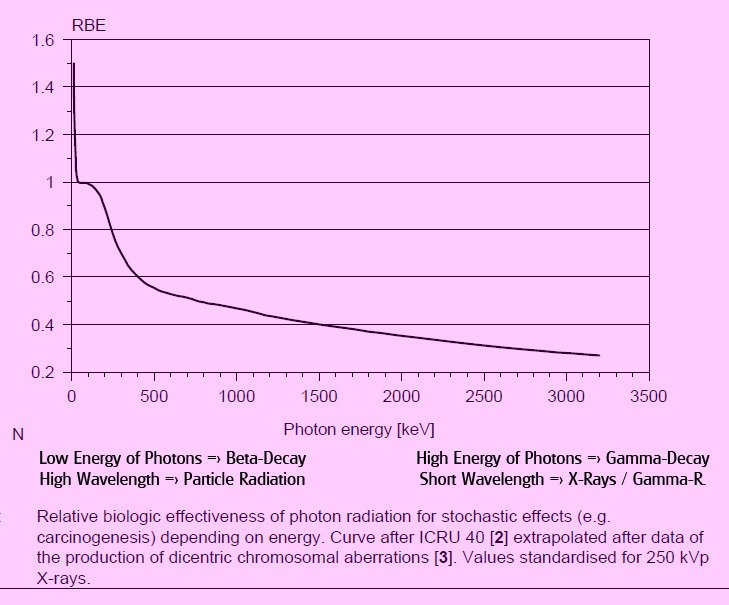 of such radiation within certain bounds. After the Paris Summit for Support of the Libyan People, yesterday March 19, 2011, about 112 U.S. and British missiles have hit special targets in Tripolis and Misrata. The U.S. are using their Tomahawk cruise missiles to be launched by navy vessels while the British have fired Polaris missiles from submarine. Furthermore, British and French air force are prepared to enter Libyan territory whenever they want. According to German radio news, the coordination of all military action of the allied forces should be located on a U.S. base in Germany, even though Germany is not directly involved in any combat mission. According to the Pentagon, 112 missiles were launched from U.S. and British [navy] ships and submarines. Sounds of explosions and of [responding fire i.e. anti-aircraft fire] in the Libyan capital of Tripolis. [of the Gadafi forces] in a bombardment South West of Benghazi. Eyewitnesses report on a resume of bombardment in Tripolis and the noise of [responding fire] spreading from the residential area of Gadafi. Eyewitnesses report on a resume of bombardment in Tripolis and [responding fire] near the residence of Gadafi. [Different] sources informed Al-Jazeera of a risky bombardment of the center of Misrata on the road to Tripolis. [The secretary-general of the Arab League] Moussa said that the bombardment of Libya by international forces is different from the aim of an obligation to prohibit any flight as has been declared by the League. After the United Nations imposed a no-flight zone on Libya, Gadafi sent his foreign minister to declare his government's will to stop all military action at once. Libyan opposition, however, is still suspicious and is celebrating the no-flight zone. demand the troops of Gadafi to stop their advance towards Benghazi. Gadafi's units will not enter into Benghazi [immediately after] a cease-fire. in Rabad Street near Tariir square in Sanaa. them in order to help the victims. Leaders of the ruling party of Yemen announce the beginning of [their party's] initiative [to solve the] crisis and a criminal prosecution of those who are responsible for today's incidents. So far, dozens were wounded or died. The dead and the wounded were brought into a nearby mosque. Pictures delivered by Al-Jazeera, Arabic service, are showing some of the most violent scenes ever seen since the uprising against the actual president began. Japan and the "Ring of Fire"